Well, Steve said, what Steve Biro had done for the past five years for JERROLD and VIKOA, perhaps Steve Biro can do it for himself. Biro Engineering, a CATV technical consulting firm, started operations March, 1970. The first two years were difficult and bumpy, as predicted, but the company survived, gaining experience and a good reputation. The first break came after a big family debate: spend the first profit for new furniture, or buy a spectrum analyzer? Besides handing our dining needs for years to come, the old kitchen table also doubled as a nice test station for our brand new HP Model 8554 spectrum analyzer which boosted our signal survey and system performance testing activities, resulting in a growing client base and many returning customers. And 40 years later, we have provided all types of technical assistance to cable systems in virtually every metropolitan area along the east cost. Below is just a sampling of the Mid-Atlantic region along the I-95 corridor. And naturally we apologize to the many systems we omitted just off of I-95. Technology kept changing. The advent of satellite reception opened a new field for Biro Engineering: the need for terrestrial microwave interference testing and small earth station signal surveys. 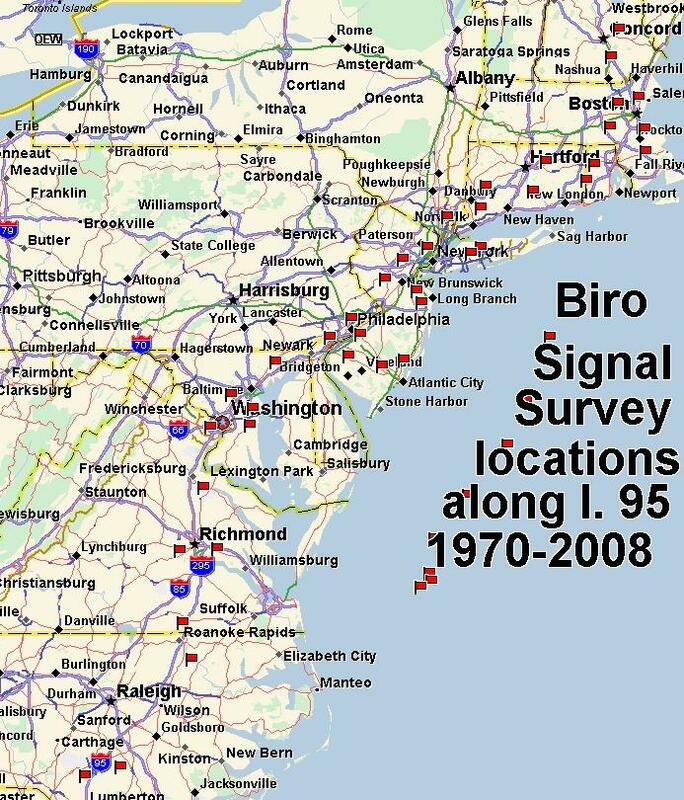 Twenty years later in the '90s, that activity faded away as the introduction of fiber networks eliminated the overwhelming majority of the terrestrial microwave links. Convincing CATEL, the FM signal processor manufacturing company, that our Computer-Aided FM Reception studies were superior to their manual search for stations, represented a major achievement. We became the exclusive supplier of the CATEL Computer Aided FM Reception Studies. The late eighties and early nineties were the years of intensive system acquisitions, financed by major banks and insurance companies. They badly needed independent confirmation that systems performed as well as claimed by the sellers. So Biro Engineering was often hired to conduct the system performance tests, presenting the results in a professionally prepared Testing Report. This became a coast to coast activity, occasionally even outside the Continental 48 States. We traveled to Nome, Alaska, for a client, as well as took several flights to get to Guam for due diligence performance testing - practically on the other side of the globe from Biro Engineering headquarters. At the Guam airport, it is difficult to miss the sign: Welcome to Guam, where the US day starts. The strategically located island of Guam is considered an unsinkable carrier in the middle of the Pacific Ocean. Our 3-day survey resulted in an honest “Don’t touch it” recommendation. The net results: our unhappy client refused to pay the quoted price to the carrier of the bad news. Nome, Alaska is located almost on the Arctic Circle and unusually close to Russia . The system carried a limited number of satellites, and of course, no such thing as over-the-air TV reception! About 8 months of the year, Nome is accessible only by airplanes. At the second day of system testing, I proposed to the chief tech to show me the longest cascade location. He drove us toward the North and suddenly stopped. What is this, I asked him? “Mr. Biro,” came the answer, “this is the end of the road!” That is the real Alaska that you can experience only during a CATV system performance testing. Next came the MUST CARRY campaign. We were hired by TV Broadcasters to prove that their signal reached the CATV head-end with the required minimum signal level to be must- carried on the CATV system. The assignment paid well, but suddenly we found ourselves on the other side of the fence, assisting our “opposition”, making many system operators less than happy. exhibiting instant and exact interference information for every desired TV station in a 100 or 125 or 150 mile radius. Unfortunately, the FCC disregarded this efficient co-channel information tool when making their DTV channel assignments, resulting in less than perfect DTV reception conditions in many densely populated TV markets. Before domestic communications satellites became operational, and CATV systems merely offered 12 to 15 channels, serving remote and rural areas, the ultimate achievement was the reception and carriage of distant TV stations, requiring the installation of 300 to 500 ft high antenna towers. To check the selected site for high signal levels and acceptable picture quality, a signal survey was performed with the aid of a survey vehicle. Checking out 3 possible locations required separate trips to each site. However, the height of the test antenna was still limited to 35 feet above ground, not a very good height to check stations from 85 miles. The Helicopter Survey, introduced by Biro Engineering, permitted the testing of all 3 locations the same day. Hovering the aircraft at a height of 150, 300 or 450 ft above ground, realistic signal level readings could be obtained and recorded. The only difficulty was keeping the hovering helicopter oriented in the right direction for a reasonable period of time. In order to obtain maximum co-channel protection, the correctly designed phased array must be precisely oriented. Unfortunately, the undesired station’s signal may fluctuate, thus making the orientation process unreliable. To compensate for this difficulty, Biro Engineering developed a simple but highly effective testing method. Install an oscillator (signal generator) at a distance of 1000 feet from the tower, exactly in the direction of the undesired station. By attaching a spectrum analyzer to the tower mounted antenna-array, the antenna gate should be turned until a minimum test-signal was received. The availability of portable GPS instruments made the selection of the test location absolutely reliable. Not everybody was thrilled when the original DTV Transition date of February 17, 2009 was pushed back by Congress to June 12, 2009, making the “seamless US DTV Transition” not exactly seamless. More than a quarter of the US TV stations shut down their analog affiliates in February, and another 25% did so gradually between February and May of 2009. This resulted in a tremendous confusion among CATV head-end engineers, who had to redesign the reception facilities, order antennas and processors, contact tower crews for changing or installing new antenna-arrays. The culprit was lack of proper, recently updated technical information about channel assignments, output powers or in some cases the relocation of the antenna tower. Biro Engineering could have left this situation as we found it and hoped that over time, systems would rectify their mistakes. Instead, we have chosen to help the CATV industry by introducing DTV Transition Emergency Services. Correct technical data, comprehensive reception studies, antenna recommendations, antenna-array/tower designs are sent overnight or electronically the same day. This specialized technical service is available not only to the industry, but as well to the FCC to rectify those less than perfect DTV channel assignments. Expect more to come later, during the year of the POST DIGITAL TRANSITION.